At Intervoice, we are excited to tell you about emerging developments in the West Balkans region. During the week of 16 June 2014, Dirk Corstens (Chair), Slobodanka Popovic & Rachel Waddingham (Mind in Camden / English Hearing Voices Network) travelled to Belgrade (Serbia) and Sarajevo (Bosnia and Herzegovina) to conduct a series of workshops on the Hearing Voices Network. Living With Voices (Belgrade): An informal workshop for psychiatric survivors and volunteers, building on the awareness workshops Slobodanka and Rachel ran in September 2013. This gave us the opportunity to explore the idea of a Hearing Voices Network and Hearing Voices Groups with local people, answer questions and plan a way forwards. Innovative Approaches to ‘Psychosis’ (Belgrade): A workshop attended by a range of mental health professionals (including some of the lead psychiatrists and psychotherapists in the region) to explore different ways of working with people who are diagnosed with a form of ‘psychosis’ – including: Maastricht Approach, Peer Support Groups, Open Dialogue & ‘Talking with Voices’. 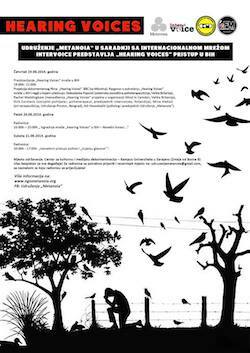 HVN: Next Steps (Sarajevo): A workshop engaging with a range of passionate and committed people who are interested in developing a Hearing Voices Network in Bosnia and Herzegovina. We explored the development of other networks around the world and addressed key challenges to establishing a similar approach in the region. Innovative Approaches to ‘Psychosis’ (Sarajevo): Similar to its sister workshop in Belgrade, this event enabled us to share different ways of working with people who hear voices (and/or are diagnosed with a form of psychosis) and think about ways of implementing these approaches within the area. The workshops included attendees from Bosnia, Croatia, Serbia and Slovenia – helping to stimulate the development of a hearing voices network in the region. Dirk, Slobodanka and Rachel also appeared on the ‘Voice of Madness’ radio show whilst in Sarajevo. Once the link is available we will share it here. We are grateful to the people of Prostor, Metanoia, Duša, I.A.N. & The Hywel Davies Foundation for their support of this initiative.